The pomegranate's crunchy seeds, each encased in sweet-tart, watery pulp, make this fruit unusual and fun to eat. Pomegranate is good for you, too, because it's low in calories and sodium, and provides potassium and vitamin C. It's also high in healthful antioxidants. Pomegranate trees make an attractive addition to home gardens. That's why this Persian native, known to scientists asPunica granatum, interests landscape architects and backyard gardeners alike. "Some of the ornamental varieties are really quite spectacular," says ARS horticulturist Charles J. Simon at Davis, California. He's curator of the ARS genebank that is America's official storehouse for pomegranate specimens from around the globe. "Pomegranate flowers are typically bright orange," says Simon, "though in our collection we do have some that produce off-white blossoms, with traces of pink, and some that are white with diffuse orange stripes. The blooms have ruffled edges and average perhaps 2 to 3 inches across when they're fully open. "Some varieties form jumbo blooms of up to 4 inches. The multiple-flowering varieties have two or more times the normal number of petals, with some producing dozens and dozens of petals per flower. "Pomegranate fruit range in size from smaller than a baseball up to a medium-sized cantaloupe," Simon notes. "The rind, or exterior, of varieties preferred in the United States is deep orange to nearly red. In China, the yellow varieties are the most popular. The little sack of pulp around each seed can range from nearly colorless through yellow and orange to almost beet red. "Pomegranate plants are quite shrubby," he points out. "If you don't train them, they form almost a bush. Trees range from 2 to 3 feet for some of the dwarf varieties up to more than 25 feet for some of the bigger varieties. They like sun and won't bloom well with much shade. Once established, they don't like to get too much water, so in this country they do best in the Southwest." The Davis genebank where Simon works is part of a nationwide system of plant repositories managed by ARS. Called the ARS National Clonal Germplasm Repository for Fruit and Nut Crops, the Davis site is responsible for collecting and safeguarding a genetically diverse assortment of pomegranate as well as more than a dozen other crops. Simon credits George A. White of Beltsville, Maryland, for expanding the pomegranate collection during a 3-year stint as curator at Davis. 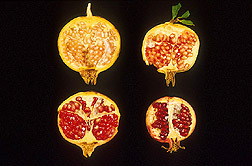 From a modest 10 specimens, called accessions, White helped build the collection—presently at 145 accessions—by acquiring pomegranates from hobbyists and others and by trekking to Turkmenistan in the former Soviet Union on a plant-collecting expedition with pomologist Dan E. Parfitt of the University of California at Davis. Today the genebank has what is almost certainly the most diverse assortment of this species in the United States. According to curator Simon, nearly all commercial U.S. pomegranates come from California's San Joaquin Valley. The 1997 crop was worth $15 million to growers.—By Marcia Wood, Agricultural Research Service Information Staff. Charles J. Simon is with the USDA-ARS National Clonal Germplasm Repository for Fruit and Nut Crops, One Shields Ave., Davis, CA 95616; phone (530) 752-6504, fax (530) 752-5974. Visit the repository on the World Wide Web at http://www.ars-grin.gov/dav. 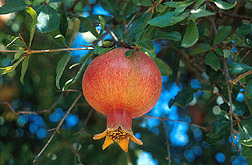 "Pomegranate—A Backyard Favorite" was published in the September 2001 issue of Agricultural Research magazine.